I’m pleased to announce that Ausblick intends to open for the 2018-19 season on Sunday, December 2nd at 10 am. G.M. Dennis Evinrude, Kyle Martola, Lynn Mallach, Ian Mortimer, and all their support staff have been working diligently and hoping to set another Ausblick Opening Day RECORD and we’re optimistic it’ll happen. Check the website for confirmation before heading over on Sunday morning and while you’re there say hello to our staff leadership, give them a high-five and a smile for a job well done. Our club has reached its maximum number of memberships and for those who were on the waiting list and unfortunately didn’t receive an opportunity to become members this season, be assured your name will remain on our wait list for the 2019-20 season. Orientation Meetings for new members is scheduled to be completed on Saturday, December 1 st. If by chance you’ve not signed up for a presentation, please contact Dennis Evinrude ASAP. Early in November, you should have received a booklet from Tamarack Resort in Idaho. Please note that this resort is offering Ausblick Members and Guests free Lift tickets with paid lodging during the months of January-March. Additional booklets should be available at the lodge in the near future. Lastly, General Manager Dennis Evinrude updates the web page almost daily with important information throughout the season. It’s advisable to check in often for conditions, webcam viewing, and our Calendar of events (currently posted). The website is also where you register for most social events and to contact Dennis. We’re also on social media for anyone unaware of it. And for those who plan on booking lessons with our Snow-Sports Team, please take the time to sign up early. Lynn has several new offerings this season and it’s common to have those programs fill quickly. On behalf of your Board Members, Welcome to another fantastic season at Ausblick. WILL SOON BE ARRIVING IN YOUR MAILBOX! If you’ve read the August Newsletter, you may recall a reference to Tamarack Resort in Boise, Idaho. Well as promised, in the near future you will be receiving a 24-page brochure mailed directly to your home by the resort. The information will familiarize you with Tamarack, plus outline the special offer afforded to Ausblick Members and their Guests while visiting Tamarack between January 2nd. and March 31st, 2019. While I have your attention, please note our 2018 Membership Ski Sale will take place from 12-noon thru 2 pm on Sunday, October 21, 2018. As in previous years, we will be accepting items for the sale on Friday, Oct. 19th. (4:00 – 6:30pm) and Saturday, Oct. 20th (1:00 – 3:00 pm). Please contact Dennis for material to pre-tag your items if you have several to be checked in for the event. Lastly, if by chance you’ve not responded to your 2018/2019 Membership renewal notice, I would urge you follow through by October 1st. Any vacancies afterward will be offered to those families on our Waiting List as a matter of fairness to those interested in becoming Ausblick Members, and the remaining vacancies will be filled on a first payer basis as has been our policy in the past. Dennis and Kyle have been working diligently this summer towards getting everything ready for another great Snow-Sports season at Ausblick. Last season we set a new record for the latest closing date in our history and while I’m not even going to suggest we will eclipse that April 22nd. date, I will remind everyone that we’ve upgraded our snowmaking system a couple years ago, so I guess we’re prepared to do our part if necessary. Our annual Membership Meeting was held Wednesday, August 22nd at the lodge and for those unable to attend, I thought you might like a brief recap of the highlights. After determining we achieved the required quorum, I provided a summary of the past season, plus board activities since the close of our longest season ever. As a reminder, our last day on the hill was April 22nd, at which time we closed the season with a fantastic closing day party. Pictures of the event are posted on our website in case you weren’t able to attend. Financially speaking, our club remains fiscally sound as we enter our fourth year of our five-year note. Last fiscal year, ending June 30, 2018, we reduced our debt by $155.K, ending the period with $959.K outstanding. Our current budget plan is to further reduce our debt by another $160.K during the 2018-2019 fiscal year. I briefly spoke of results of last year’s ski sale and mentioned that this year’s Ski Sale is scheduled to take place Sunday, October 21st., Equipment turn-in will be Friday, Oct. 19th (4:00-6: 30 pm) and Saturday, Oct. 20th. (1:00-3:00pm) providing we have enough volunteers to staff accordingly. Lots of complaints on dirty dishes and utensils being left in the kitchen, so all will be eliminated with the exception of wine & bottle openers, plus pizza cutters. Please be advised that you will need to bring your own plates, cups, and silverware this coming season. Crowded conditions within the lodge and on the hill on Tuesday & Thursday Race practice nights also stood out. The Board is looking into options that might allow our SnowSports Instructors to relocate making additional lodge space available. Also, we have thoughts on making space available within the lodge on Tuesday & Thursday Race practice evenings. Further, we have already removed several trees on Long Chute (Woods Run) to afford the Race coaches to relocate a practice run on race nights, thereby opening up more space on Main for General Membership access. Saturday Adult nights verses Continuous Hours on Saturdays also surfaced as a topic. 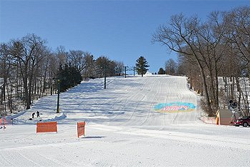 After recognizing that Saturday Adult night attendance seems on the decline, our Board decided to only schedule two Saturday Adult evenings this coming season (1 in January, 1 in February) and to adopt continuous skiing hours on Saturdays this season. Now for a bonus! Your Board has been working on options to increase the value of your Ausblick Membership. I’m pleased to announce that we have an agreement with Tamarack Resort, north of Boise Idaho, for the January-March 2019 period. Ausblick Members and their Guests will receive FREE lift tickets when booking lodging directly with the resort. We’re finalizing the details and will publish them when available. And for a local boost, Wildwood Lodge in Pewaukee will be offering a preferred rate for Ausblick Members and their Guests. Details forthcoming. And as always, I reported on our Club’s Membership status. The 2018-2019 invoices were mailed out a bit late this summer due to our transition upon Vivian’s retirement. I apologize for any inaccuracies as we manage our way through the transition. The process is improving. With regards to the Membership, 507 invoices were mailed out in early July. As of the annual meeting, 359 members renewed their membership while the remainder are pending. It’s important to understand that if you haven’t followed through on sending in your membership renewal, there are 54 pending applications on our Waiting List. Reminders will go out in the near future to those pending, however, if we don’t hear from you, the next step is to send invoices to those applicants waiting to join Ausblick. Our previous season may have renewed interest in Ausblick because we’re receiving applications during the summer months which is very unusual and yet optimistic as we hope for another great snowsports season. Lastly, three directors were re-elected to another three-year term on the Ausblick Board. Congratulations to Scott Grady-V.P., Mark Wierman-Director, and Mike Guetzke-Director. Congratulations to Abby Horn, our new Ausblick Ski Patrol Representative for the next two seasons replacing Scott Robertson. Thanks, Scott for all your leadership; welcome Abby. In closing, I appreciate those voting members who sent in their proxy ballots and those who took the time to attend our meeting in person. I personally thank and appreciate our Board Members for their time, efforts and guidance in managing Ausblick over the past year. Most importantly is the recognition General Manager – Dennis Evinrude, Lynn Mallach-SnowSports Director and Outside Operations Manager-Kyle Martola deserve. It’s their leadership along with their respective staff that affords our Membership the experience we enjoy every Snow Sports season, often in spite of the weather. They say a picture is worth a thousand words, well……..
…….. Let’s hope for that trend reversal everyone is talking about. need is cold enough weather to make all the snow we need to enjoy everything Ausblick has to offer. their idea, planning and execution of the event. It was so successful that my guess is there will be another next summer! The second, our annual Membership Ski Sale was held on October 1st. Weather was awesome, as it typically turns out. refreshments available during the event. Thank You all and I sincerely hope you’ll be back in the fall of 2018.
need to close our membership in enough time to have our directories printed, hold new member orientations, etc. Think snow…… or at least cold weather. Well Mother Nature decided how long our Ski season would be and it is hard to argue with her. While December was quite normal with an opening on the 17th (exactly our long term average), January February and March were anything but normal. The National Weather service acknowledged that this winter’s weather was record breaking. Dennis related to me and others that in his 46 years at Ausblick he has never seen such extremes. In spite of the weather our new snowmaking system helped us make the best of it. When we did have temperatures suitable for snowmaking, we were able to double our previous output until we exhausted our water supply. After refilling both ponds and continuing our snowmaking, we were able to enjoy our opening day on the majority of our trails with a comfortable base. Kyle worked hard to get us to that comfortable season start, however the weather did take a toll on our event attendance. Ladies and Men’s days, as well as our seasonal guest receipts, ended up substantially below a typical season’s expectations. A bright spot was Lynn Mallach and the performance of our Snowsports School. For the third season in a row she has presided over a record number of lessons. Our Ski and Snowsports team is a testimonial of a responsive organization, one that continues to provide opportunities and enjoyment for our membership. My sincere appreciation goes out to Lynn and her staff for another awesome season serving our membership. And it goes without saying the same feelings are extended to General Manager Dennis, Kyle (Snowmaking & Grooming Operations), Ian (Lift Operations) and our front office staff for all their contributions in making an unusual 2016-2017 season as reasonable as possible. In closing and on behalf of the Ausblick Board of Directors, I’d like to thank our membership and guests for their understanding that “unusual” weather conditions happen on occasion. This past season shouldn’t be perceived as an indication of next season’s weather, but rather that the odds of two similar seasons back to back, are very unlikely. And with the optimism of a great 2017-2018 season just eight months in the future, I’ll close with wishing everyone a safe and enjoyable summer. Spring weather wasn’t anything to be fondly remembered and Summer is almost upon us, hopefully. Looking back to the past ski season, I can only comment that the weather wasn’t co-operative and that unfortunately, we experienced the second latest opening since we’ve opened our doors in 1973 as the Ausblick Ski Club. The intent of this newsletter is to share some optimistic news that should help mitigate what we’ve experienced last season. As you may know, we need weather below 28 degrees to make snow; ideally below 23 degrees. Given the required temperatures, our snowmaking systems require approximately 5 days to cover enough ski terrain to open for skiing. Snow quality is greatly affected the closer it gets to the upper boundaries of 28 degrees. Temperatures last December were a huge limiting factor. Now for some good news. As many of you know, two years ago we took steps to advance our Long Range plan by replacing the old snowmaking infrastructure along the bottom of the hill. This “first step” in the total replacement goal offers a huge advantage in our snowmaking capabilities. We started the project in May and will complete the “piping” work by the end of June. A new pond (4.7 million gallons of water) at the northwest end of the property should be complete by the end of July and the first high capacity pump that’ll feed the new snowmaking system will be installed and tested in October. We’ve added a few additional snowmaking guns, lights, etc and when complete by next ski season, Ausblick will have two independent snowmaking systems serving our skiable terrain. The new system will cover the open area from the new pond, down to the lodge, affording the handle tow and terrain area to be covered in half the time as previously required. We’ll still require the optimal temperatures to make snow, however with two systems making snow we should be in a better position to deal with mother nature’s surprises. Over time as we continue to manage our clubs finances responsibly, we will advance the Long Range Plan further by building out the new snowmaking capacity to cover the Big Dipper, Racers Ruin and the ski runs through the woods. Additional piping and pumps will be necessary as we extend the new snowmaking infrastructure into a total replacement of our 37 year old system currently in place. This newsletter has been enclosed with your invoice hoping that it’ll provide a bit of optimism for the coming season. Further, your club Board has decided to keep Membership Dues level for the coming season because the shorter season last year afforded us the ability to save some operational costs. Ausblick’s Ski Sale is scheduled for Sunday October 23rd. Also, our club’s Annual Meeting is set for Wednesday August 17th. at 7pm and held at the lodge as usual. Please make your calendars for these events. More information will be forthcoming. Lastly, our membership list continues to grow. We’re still receiving applications in May! If you know of anyone interested, it might be worthwhile suggesting they get on the list soon. Applications can be downloaded off our website or by contacting Dennis Evinrude at the club. Welcome back to the Ausblick Ski Club, the Midwest’s finest private ski & snowboard Membership Club. The Holidays are rapidly approaching, temperatures continue to fall and the leaves are nearly all on the ground. All reminders of the 2014-15 ski season that will be here before we realize it. Welcome to the new Families and Members who have joined Ausblick this season. General Manager Dennis Evinrude and his staff have been diligently working to insure our facility is ready to go at the first opportunity to kick off the season for our Membership. However, it’s important to remind everyone that while commercial operations open as soon as possible, we at Ausblick take the time necessary to insure we have a sufficient base to carry us through unexpected weather conditions that may impact our ability to maintain our outstanding conditions for Membership. We can only hope for a solid week of continuous cold weather in early December to afford us opening well before Christmas week. New Member Orientations have been scheduled for Sunday November 9th (1-3PM) and Wednesday November 19th (6:30-8:30PM). All new Members are required to attend, notification should have been sent out asking everyone to register for one of the dates. As a reminder to everyone, we require some paperwork and information to be updated annually. Dennis has implemented a way for you to accomplish this electronically, greatly improving the process. Watch for more information in his update further in the Newsletter. We have a new Ski School Director this season. Lynn has a diversified background and I’m confident she’ll continue Ausblick’s tradition of providing the highest quality of service to our Membership. As the season kicks off, please stop by, introduce yourself and welcome her to our family at Ausblick. Lynn also has a message further within this Newsletter. Our annual Ski Sale was recently held in near perfect weather. Our Board hopes you may have had the opportunity to stop by and take advantage of this great event. This year we turned over $23,610.’s work of equipment and clothing in less than two hours. We continue to refine the program through helpful suggestions of the many volunteers that give their time and energy to make this event successful annually. My sincere appreciation to all those involved in the planning and execution of the event, and also all those who stopped by to shop the sale. It’s always great to see all the renewed friendships as we approach the new ski season. We’ll be closing Membership soon and directories will be going to print shortly afterwards. Now would be the time to contact Vivian Clark or Dennis via e-mail and update any information that may have changed since last season. It’s also important to understand that our primary way of communication with Membership is via e-mail. Please insure our correspondence isn’t directed to a spam folder if possible. You might miss important information regarding social events, etc. One last reminder, as we approach opening day I’d like to suggest watching the Ausblick Website for the most current information. Dennis will update the site as progress is made. For those visual members, the Web Cam is worth checking out. Have a wonderful and safe Thanksgiving Holiday. Go Pack! President Bob alluded to something we are very excited to be rolling out. For years we have had the daunting task of trying to keep the Member and Guest releases stored and up to date. Aside from the fact that we accumulate a lot of paper for storage we have found it difficult to always get all signatures for every family. We have implemented a new electronic system called EZWaiver. Any member or guest will be able to execute a release on any Computer, Hand held, or Mobile device from anywhere. All new members Orientating on November 9th will be sent a link before November 8th. The rest of the new members will be sent the link before their November 19th orientation. The general membership will get the link before Thanksgiving. The link will also become accessible by clicking on “Guest Waiver” on the home page of our Web site (www.ausblick.org). The beginning of the process is the same whether you are a guest or a member. The goal is to enable you to process your season or guest waiver before you ever get to the registration counter to secure your season photo ID or a guest ticket. I look forward to working with you during this conversion to a “streamlined” process. We have not undertaken any expensive projects this year in the interest of building up our capital investment reserves but have made some changes here and there. The parking lot has been resealed and restriped and the plow we used to clear it is new for this season. We have also purchased another 30 chairs for the lodge to help us cope with those few busy days we have every season. Our new Ski School Director sent out a survey earlier this year which I want to thank you for participating in. The responses have helped her shape the offerings for this season. The rest is in her report. When arriving at the hill for the first time this season please take the time to stop and introduce yourself to her. In closing I wish you a Happy Thanksgiving and look forward to seeing all of my “Ausblick” family soon. We are pleased to announce that long-time ski professional Lynn Mallach has accepted the position as Ski/Ride School Director. Lynn brings a wealth of experience to Ausblick, dating back to the mid 1980s, when she was the Ski Patrol Director at Olympia Highlands. Prior to coming here, she was the Ski/Ride Director and Group Sales Representative at Devil’s Head Resort. Lynn is a certified Level III PSIA alpine instructor and AASI Level II snowboard instructor and has instructed at the Yellowstone Club in Montana, Snowbird in Utah and a number of hills here in the Midwest, including Ausblick. Ausblick Ski/Ride School is excited to introduce the following programs for the 2014/2015 season. The programs were established based on the results of the recent member survey and other industry trends. A detailed email will be sent out soon with details, pricing and dates. Whether you are new to skiing and snowboarding or are a seasoned veteran looking to improve on advanced techniques and/or terrain park skiing and riding, private lessons from the Ausblick & Snowboard School instructors will take your abilities to the next level. Instructors are hand-selected to match each individual student and provide highly customized and personalized coaching and instruction. Designed for kids who can ride the lift — ages 7+ (skiers and riders). Groups are small and organized by ability. Starts Friday January 9th and ends with a graduation party on February 6th! Members only event. Our specially-trained staff will engage your child in a world of wonder and fun. Groups of four or less utilize our unique indoor and outdoor resources to help each child learn to ski and explore the area on their own terms. Children from ages 3-6 years old are eligible. If you’ve ever wished you could pull off some of rad moves and safely land the big air that looks so impressive in the terrain park, this clinic is for you! Riders and skiers must be able to ride the lift, have basic skiing and riding ability and 7 years old and above.. There will be a beginner clinic and advanced clinic for four Saturdays starting January 17th and ending February 7th. Wednesday night clinics will be offered this year for adults and will include learn to turn, and advanced skiing and riding techniques. Two sessions will be offered, Session 1 starts January 7th and ends January 28th, Session 2 starts February 4th and ends February 25th. Race workshops will be hosted twice this season and include race etiquette, explanation of courses, gate training and friendly head-to head competition. Open to skiers and snowboarders. Watch for news about Special Women’s Day and Men’s Day Workshops, and a Spring Western Trip to Big Sky, Montana! Lesson rates remain the same as last year. Please stop at the ski school desk and pick up the brochure with complete information. We recommend you call ahead to reserve a place in the lesson or clinic you are interested in. There is limited availability. Every effort will be made to place you with your favorite instructor. 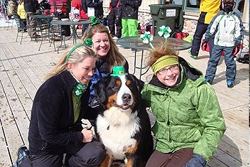 Ski School Office: 262-820-3616 (Staffed Saturday-Sunday 9:30 am -3:30 pm). You can also leave a detailed message with contact information. It is hard to believe that Christmas is only a week from today. With all the busyness preparing for the Holidays some of you may not know that Ausblick is open for the season. Tonight will be our first Wednesday/Adult Night and we hope you will consider taking a break and enjoying the evening at Ausblick. The message on the website and the answering machine will keep you up to date on any changes to the scheduled Holiday Hours. Please stop at the office to get your ID card for the year and sign the annual Release Form. To make the process quicker you can click on the link below to print the form and complete it ahead of time. Bring it to the office when you pick up your ID card. Release Form 2013/2014 Happy Holidays! Welcome to the Ausblick Ski Club. Our ski season is rapidly approaching and as our way of insuring you and your Family become familiar with our club, rules and expectations; we require new members to attend a pre-season orientation. Two sessions are offered so that families can schedule accordingly. This season’s dates are: Sunday, December 1st (1-3pm) and Wednesday evening, December 4th. (6:30 – 8pm). Kid sitting will be available at both sessions. After the information is delivered, you’ll have the opportunity to sign annual acknowledgements and have your Member I.D. card(s) issued in advance of the season start. Just think, no waiting in line at the front desk on your first visit out for the season! Please note that an RSVP is required for the date you’ll be attending. Please contact Perrie Dralle at (414) 302-1825 to reserve your spot. For additional Orientation Details, an Event Flyer can be viewed on our website at “www.ausblick.org”, or by contacting the ski club at 262-246-3090.